Very few human growth hormone formulas have had proper, independent IGF-1 testing. Our ProBLEN formula was independently clinically tested and the result was an average 160.6% increase in IGF-1 after five months of therapy. This is the highest blood IGF-1 increase that has been legitimately obtained with a non-prescription HGH product. No other product has better results. If you are trying to decide which product is best you should know that independent randomized double-blind placebo-controlled IGF-1 clinical studies can be used to measure the effectiveness of any product. Because human growth hormone is only in the bloodstream for a couple of minutes before being taken in by the liver measuring an actual HGH level is very involved and time consuming. Growth hormone stimulation tests are also risky. 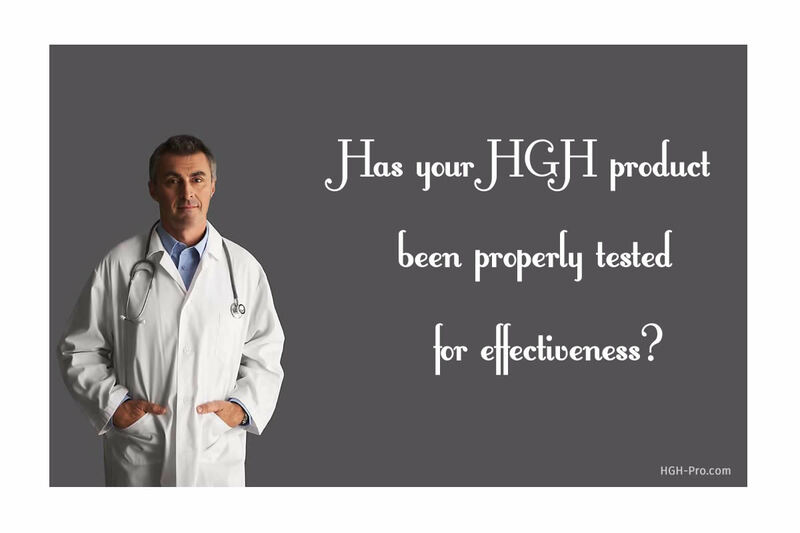 Some patients have suffered serious complications due to HGH stimulation testing. Due to the reasons mentioned above doctors and researchers will usually check the patient's blood IGF-1 level instead, since IGF-1 is stable in the bloodstream longer and is a direct reflection of the amount of human growth hormone in the body. All clinical studies should be done by an independent, professional testing facility. They should not be done "in-house" or by anyone employed by the company who makes the product, or by any sellers of the product being tested. The studies should not be done by anyone who has an interest in the product being tested, or by anyone who could possibly benefit in some way if the product tested well or showed certain results in the study. Independent randomized double-blind placebo-controlled IGF-1 clinical studies is accepted as the proper form of testing the effectiveness of HGH supplements. This study measures the blood IGF-1 (insulin-like growth factor-1) level of all the test subjects before therapy begins and also after they have taken the therapy for a specified amount of time. The "independent" means the study is done by a professional facility that has no financial or other interest in the results of the formula. Studies done "in-house" or done by the owners of the formula do not carry the same weight, since they obviously have something to gain if positive results are obtained. The "randomized" means that a group of individuals is chosen to participate in the clinical study. Some will take the actual formula and some will take only a placebo (contains no substance), but the choice of who takes what is random. The "double-blind" means that nobody involved in the study knows who is taking the formula being tested and who is taking a placebo until the study ends. The "placebo" means that some test subjects are given a "fake" dose of the formula but they believe they are taking the actual formula. This is done to measure how many benefits are brought about because the test subjects believe they are taking the formula. This is called a "placebo effect". The test subject experiences certain benefits because he believes he is taking a formula that should cause the benefits. How Long Should IGF-1 Clinical Studies Last? We know that certain amino acids can temporarily stimulate the pituitary gland to release HGH. However, we also know that the pituitary gland can become resistant to large doses of amino acids within the first three months. This is why products that are made up of amino acids, usually the capsule products that are digested, may only be effective at increasing HGH for a maximum of three months. For this reason the best clinical studies are the ones that are carried out longer than three months in order to show whether the improvement in the IGF-1 blood level is sustainable. The sellers of one particular HGH product claim their product increased IGF-1 levels over 400%. They may even give long narratives about the patients in their clinical studies but you won't find the name of a doctor (that is legible), or the name of a facility mentioned anywhere in their clinical studies. They won't say who did the studies or where the studies were done so that should tell you something. Obviously the clinical studies they advertise are not legitimate if no doctors or facilities will place their names on the work! Some claim their product increased IGF-1 up to a certain percent. For instance, they may advertise their product increased IGF-1 levels up to 240%. What they are doing is advertising only the IGF-1 result of the one patient who had the highest IGF-1 increase in their study. They are using this one result to make it appear that their formula has higher clinical results than it has. This is very misleading. We could also just advertise the result of the one patient who had the highest result in our study and ignore all the others in the group who did not have such a high result; this would raise the IGF-1 results we could advertise even higher, but by doing this we would be misrepresenting the study results. This is exactly what some are doing. The results of all patients must be measured using the same guidelines and the results of all patients who participated in the study must be included in the end result. How much faith should you place in a company who reports their clinical results in this way? They try to convince you their product is best based only on the result of the one patient who gave them the most positive result, which helps their cause, and they ignore the results of all their other patients who did not have such a high result. Lastly, some competitors are claiming their product "doubled IGF-1 levels" but that is all the information they give. They don't show you any evidence that a clinical study was actually done. They have no clinical study specifics on their web site such as the pre and post IGF-1 levels of the patients, they don't tell you who did the study or where it was done, and they don't give you the average IGF-1 increase of the group at the end of the study. If they had legitimate clinical studies they would not just mention them, they would make sure everyone who visits their web site sees their results. Just stating that an HGH product doubled IGF-1 levels doesn't tell you anything. For instance, if a patient had a pre therapy IGF-1 blood test result of 1 and their product raised that patient's IGF-1 result to 2, would that be an effective product? The patient's IGF-1 level would have been doubled like the company or distributor claims. Of course that product would not be considered effective. Hopefully no patient will ever have an IGF-1 level that low, I am only making the point that just stating a product doubled IGF-1 levels is not giving any real information about effectiveness and can be very misleading.